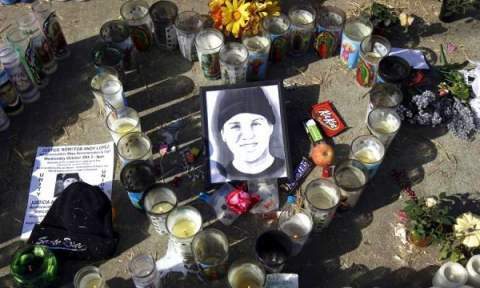 The October 22 killing here of 13-year-old Andy Lopez by a hail of bullets from sheriff’s deputy Erick Gelhaus has resulted in daily peaceful marches, prayer vigils and speaking events honoring Lopez and calling for justice, as thousands in the northern California community continue to mourn and express outrage. The killing has also this week led to a federal civil rights lawsuit being filed on behalf of the Lopez family. “There is a practice of using deadly force and covering it up by investigations that are superficial,” attorney Arnoldo Casillas said at a November 4 press conference in San Francisco, according to the daily Press Democrat. Casillas, who filed the suit, contends that the killing was unconstitutional because it violated the Fourth Amendment to the U.S. Constitution, which limits police authority. Casillas interviewed witnesses who dispute law enforcement claims about the shooting. He asserts that the first shot was fired within three seconds of Gelhaus’s command to Lopez to drop what the sheriff's deputy claims he thought was a real gun. Seven bullets hit Lopez. One pierced his heart; at least one him him in the buttocks. Non-lethal alternatives were possible. The second deputy traveling with Gelhaus did not fire a single shot -- and did not even have time to step out of the vehicle before the boy's body lay fatally shot on the street. Last year, Casillas won a $24 million dollar settlement for the family of a Los Angeles boy who was shot once and paralyzed by police while playing with an airsoft BB gun, similar to the one that Lopez was carrying to return to a friend when he was killed. But what is officially reported and what actually happens on the street may differ. That's why having next-door-neighbor law enforcement agencies investigate the killings is starting to look more and more like damage control than independent or objective reviews. More bluntly: are they amounting to cover-up investigations by law enforcement departments tasked with investigating each other? “We want an honest investigation,” said the boys' father, Rodrigo Lopez, at a recent press conference. He and Andy’s mother, Sujey, attended a rally this week, and have been present at different public events honoring their son. The Sonoma County public has actively criticized the Sheriff’s Office's actions, slamming its excessive use of deadly force. Deputy Gelhaus is one of the office’s trainers and has published many articles and online comments in SWAT magazine advocating the use of deadly force. The community is calling for a civilian review board to conduct an independent investigation. The incident shattered an already poor relationship between the Latino community and law enforcement in this city of 160,000, located one hour north of San Francisco. It has also ruptured the image of quiet Sonoma County as a peaceful place to visit and buy wine. Not least, it has deepened the lack of trust in local leadership by the growing Latino population, which already represents one-fourth of the Santa Rosa population. As people have gathered in recent days, many Latinos told stories of abuse at the hands of law enforcement, especially the Sheriff’s Department. Signs like “Sheriff Wanted 4 Murder” appear on fences and at marches. Such incidents have the additional impact of making community policing more difficult for other law enforcement officers who are less trigger-happy. Some police departments, such as the one in Sebastopol, do community policing and have not been noted for killing residents. On Tuesday, hundreds of activists attended three separate events miles away from one another: a rally outside District Attorney Jill Ravitch’s office in Santa Rosa, a meeting of the Sonoma County Board of Supervisors, and a teach-in at Sonoma State University in the nearby city of Rohnert Park. The “Jailhouse 4 Gelhaus” march went from downtown Santa Rosa to the DA’s office. “Killer cops off our streets,” chanted the marchers, as hundreds of protestors gathered outside and a delegation met with the DA. As in the past two weeks, the peaceful demonstrators were again met by cops clad in riot gear. Activists demanded that the DA convene a grand jury and charge Gelhaus for the unlawful killing, something Ravitch said she is unauthorized to do until she reviews further information from police. “Nobody will have the wool pulled over their eyes. There won’t be a whitewash,” vowed activist Jonathan Melrod. “One thing that came of that meeting is [that] what the DA plans to do will be based on criminal evidence gathered by the Santa Rosa Police Department,” Melrod added the following day. “That is like the fox guarding the chicken coop. So we will gather evidence from witnesses and people who have had previous contact with Gelhaus -- and we will present [that] overwhelming weight of evidence to compel an indictment of Gelhaus." District Attorney Ravitch has reportedly not gone into the Latino neighborhood where Lopez was killed to listen to members of the community, and has repeated her refusal to fire, arrest, charge or prosecute the deputy. She said she intends to take 90 days to review the information -- a period deemed too long by an impatient Santa Rosa community that is now raising calls for a "People's Tribunal" to mete out justice. Earlier on November 5, activists attended the Sonoma County Board of Supervisors meeting, whose members had been on a gag order not to speak about the killing by the board's attorney and city manager. On person in attendance, Alfredo Sanchez, compared the Lopez killing to a recent incident that took place in the wealthy area of Fountaingrove, where police engaged a gun-wielding resident in an 11-hour standoff and eventually took him into custody unarmed. Compare that to the few seconds Gelhaus gave the unarmed boy before executing him. The cops “seem to act as predators to the people they are meant to protect and serve,” said Jose Casaneda of nearby Windsor. In addition, both of the area's public colleges—Sonoma State University and the Santa Rosa Junior College—hosted teach-ins that were open to the public and invited people to discuss the shooting. “The Andy Lopez tragedy is intimately implicated with the militarization of this nation's police -- a kind of militarization that encompasses not only the implements of death but also states of mind on the part of that militarized force,” Byrne added in an interview. At the overflow, standing-room-only gathering of around 150 students, faculty and staff at SSU, Chicano and Latino Studies professor Ron Lopez commented, "Kids do not have appropriate places to play in southwest Sonoma County,” a theme people in the community have echoed repeatedly since the killing. During the panel and discussion, a large screen conveyed photos of the community's response to the Lopez killing, and connected it to the shooting of African Americans Oscar Grant in nearby Oakland, and Trayvon Martin in Florida. A National Day of Protest is scheduled for Saturday, November 9, on Veterans Day, at Julliard Park in Santa Rosa, from 1 to 5 p.m. People are asked to “come tell your story.” The flier for the event reads: “I Am Andy Lopez and My Life Matters.” There will be solidarity protests happening elsewhere across the nation. Find out more and join an event here.